Hey! What are your plans for that artichoke you’ve got there? You’re going to grill it and serve it with some lemon-butter sauce? That’s cool. We’re just going to stick ours in this MRI machine here. Alexandr Khrapichev, a professor at the University of Oxford, put together this selection of what he calls “virtually-sliced” fruit and vegetables by running them through an MRI machine and putting the slices into chronological order to create these deconstructed fruit and vegetable portraits. Fruit and vegetable MRIs are lovely (whether as stills like these or as GIFs)—but they’re also interesting for what they reveal about which ones feel familiar and which ones feel alien. The apple right below is pretty instantaneously recognizable, while the artichoke you see above is more of an abstraction than anything like what you might picture. Part of this is the constancy in the overall shape of the apple versus the artichoke, but it’s also their sheer familiarity. While the artichoke is a bit of a mystery, the apple is a fruit icon and, no matter how you slice it, we still recognize it. Images: Alexandr Khrapichev, University of Oxford (Wellcome Images). 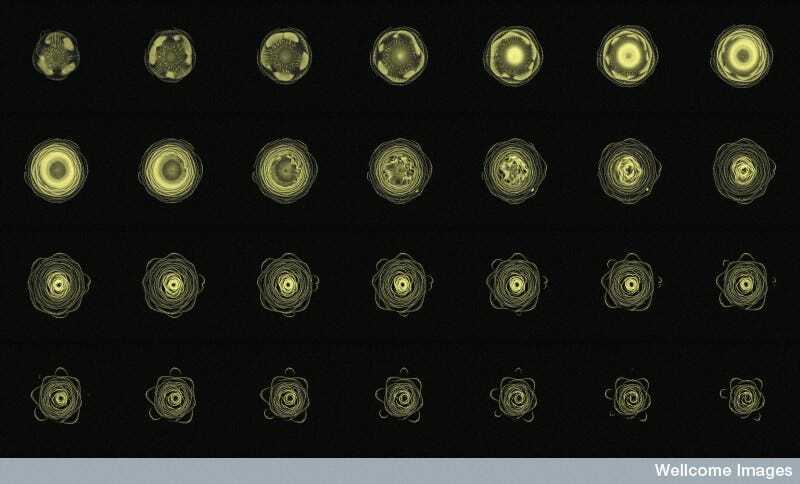 In order: MRIs of an artichoke (top), apple, persimmon, pumpkin, passion fruit, orange, cabbage, garlic, kiwi.